I can't remember where I saw the inspiration for this hat, but as soon as I saw it I needed to make it. 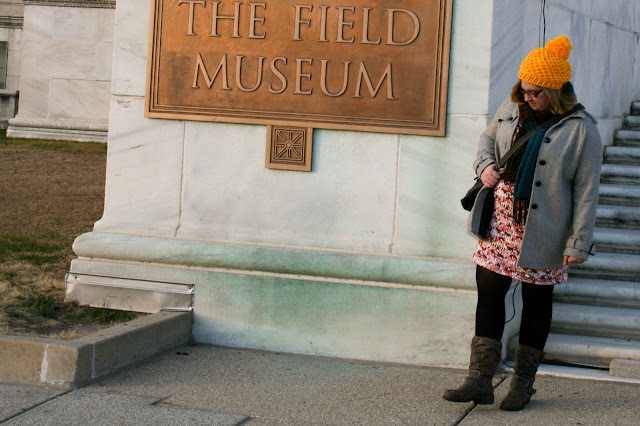 It's a really simple combo of a beanie + crocheted mesh (like a market bag). I sort of just made this on the fly so I don't have a pattern written down, but I'll give you some resources & a blend of two patterns. When I was little, the first thing my gramma taught me to make was a beanie, a yellow beanie in fact. Now I pretty much have beanie making skills where I don't need a pattern so I don't write them down. The pattern mentioned above is pretty much how I make mine so you should be golden. Start working the beanie pattern up, I made my beaning a bit bigger because it's gonna be cold & I wanted the warmth to swirl around my head :). Before you finish your beanie you'll want to make a brim with a few rows of the rib stitch - or Front Post Double Crochet. This will create a sort of cabled brim around your hat. This is a great tutorial & when you hover over the images, you'll see the view for a left hander. Pretty neat! I did three rows of this rib stitch, doing a front post double crochet on top of each front post double crochet. Now onto the mesh part: I also used to make mesh hats during the summer, so I kinda have this to memory too. 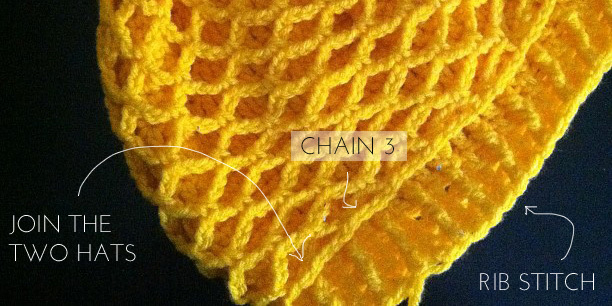 But this pattern is pretty close, use the same size hook you did for your beanie to complete it. You'll want to work the mesh hat down until it fits over your beanie just above the brim. You may have to repeat the last few rows of the mesh hat pattern until it fits. Then you'll begin to join it together. Pick a spot to start joining your mesh hat to your beanie just above the ribbed brim part after you've finished the last row of your mesh hat. Put your hook under a double crochet from the beanie - like when you were working the front post double crochets - and slip stitch. You've started joining the two hats together. This may take a few tries, but mine ended up needing 3 chain stitches between each join. So, chain 3, slip your hook under a chain loop & then under another double crochet from the beanie (count three over from your last join) & slip stitch. Repeat this around until your mesh hat is joined to your beanie just above the ribbed brim. Now make your pom pom. This needs to be a big 'ol pom pom! So if you've got your preferred method....go ahead & do that. I wrapped the yarn a bazillion times around a square of cardboard that was about 4 inches square. Once I thought I'd wrapped enough, I wrapped a bunch more. Then I slid it off, tied a string around the center - tight, & cut the loops. Then shape it into a circular pom pom. Tie your pom pom to the top of both hats - through the mesh one & into the beanie. Now, you have a cool vintage inspired hat. More or less. I hope this pattern made sense & I'm sorry I don't have more of a precise method. I tend to crochet organically & hardly ever write patterns down. This will for sure be the next hat that I make (after the one I am working on now). Did you get a chance to check out my beanie tutorial?